Lately it seems that a new cartomizer variation comes along every week or so. From clear cartomizers to tanks, there are seemingly endless variations on the theme. Sometimes the simplest approach is good enough and EV cartomizers prove the point. The two versions of the EM cartomizer that I received from EVCigarettes are nearly identical to some others on the market, both in design and performance. That’s a good thing, because this design of cartomizer is as effective, easy to use and enjoyable to vape as any. The cartomizers came in two levels of resistance, low and regular, which EVcigarettes lists as 2.3 and 3.3 ohms respectively. My tests showed them to be a little lower than that at 2.1 and 3.1 ohms, but all were within .2 ohms variance. Both versions performed well at 3.7 volts, with the low resistance providing a slightly warmer and enjoyable vape. They really deliver a great combination of flavor and throat hit when used on variable voltage at 4.2 to 4.5 volts and this is a favorite combination of mine. Flavor production is excellent on these cartomizers. The true flavor of the e-liquid comes through well and lasts through the entire fill. The soft cap is easy to remove, making filling and topping off easy. After topping off one of these for about a week, the flavor started to decrease as expected and the cartomizer was able to absorb noticeably less liquid. A quick cleaning brought it back to life and ready for another weeks worth of use. After a couple of weeks, it’s still going strong. 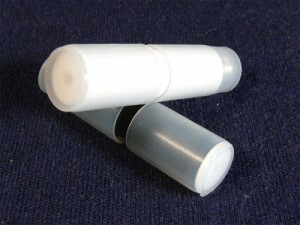 There are several methods that can be used to refill these cartomizers. Starting with the cap fill method, about 25 drops of e-liquid are dripped into the cap that was removed from the cartomizer. 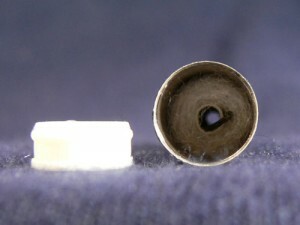 There is a removable plug from the battery end that must be removed before adding liquid. Once the liquid is in the cap, simply push the mouthpiece end of the cartomizer down until all of the liquid is absorbed. Another method is to simply drip into the battery end. When holding the tip of the bottle close to the hole in the middle, the cartomizer will seem to almost pull the droplets off the end of the bottle until it is full. Finally, liquid can be simply dripped into the mouthpiece end with the cap removed by holding the cartomizer at a slight angle. In either case, about 25 drops should fill an empty cartomizer. No matter which method is used, best results will be achieved by rolling the cartomizer between your fingers or on a hard surface a few times to distribute the liquid. It’s also best to leave them sit for a half an hour or so before vaping. These aren’t the fanciest or largest cartomizers on the market, but their simplicity and ease of use make them a good value. Be sure to enter the coupon code “vapingguides” at checkout for 15% off your order at EVcigarettes.